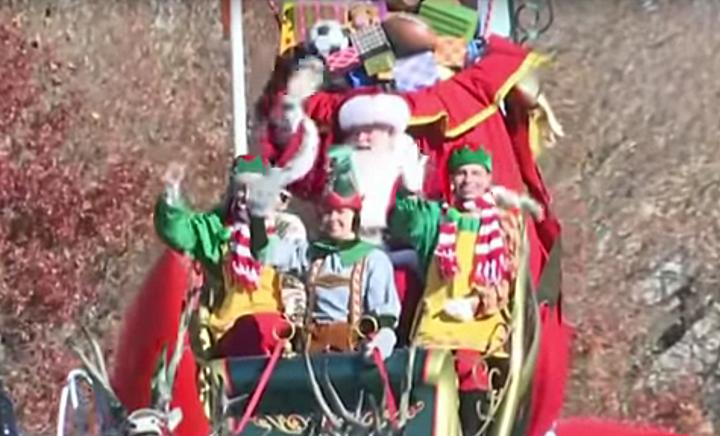 “This is for TV!” hollered a gentleman whose mission was to get Santa’s sleigh ready for its closeup during the live broadcast of the 2018 Macy’s Thanksgiving Day Parade. It had been a challenging morning. 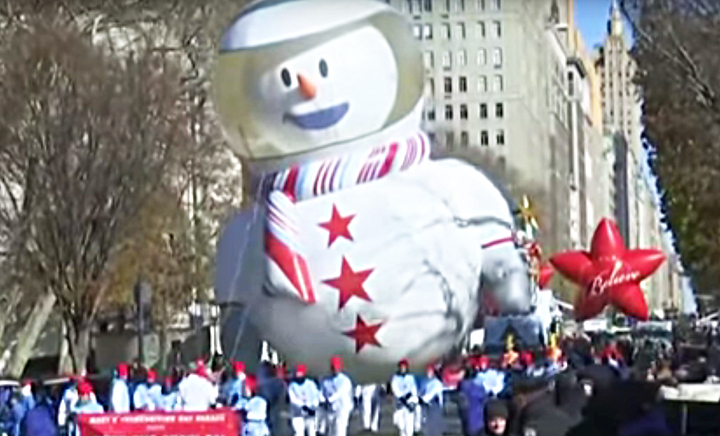 Nov. 22, 2018, was declared the coldest Macy’s parade ever. It was windy, too, so all of the balloons were flying low. 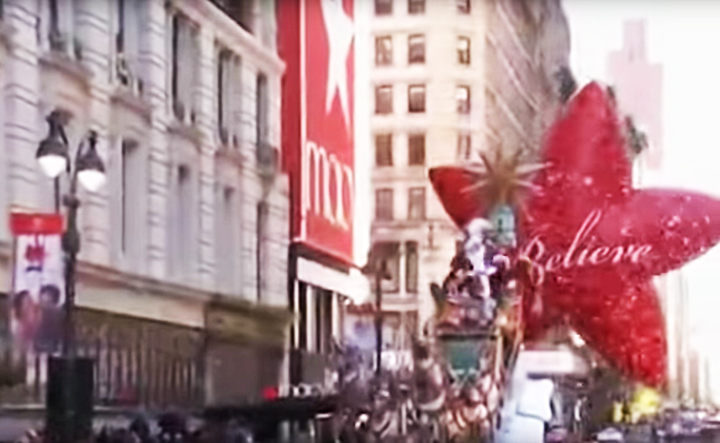 The Red Stars — dead last in the parade, behind Santa — were misbehaving. We often struggled as wind gusts caused the stars to veer wildly. A couple of times, the stars bumped into each other. Once, Red Star #2 actually touched down on the street — a safe distance from spectators, if still kind of ominous. 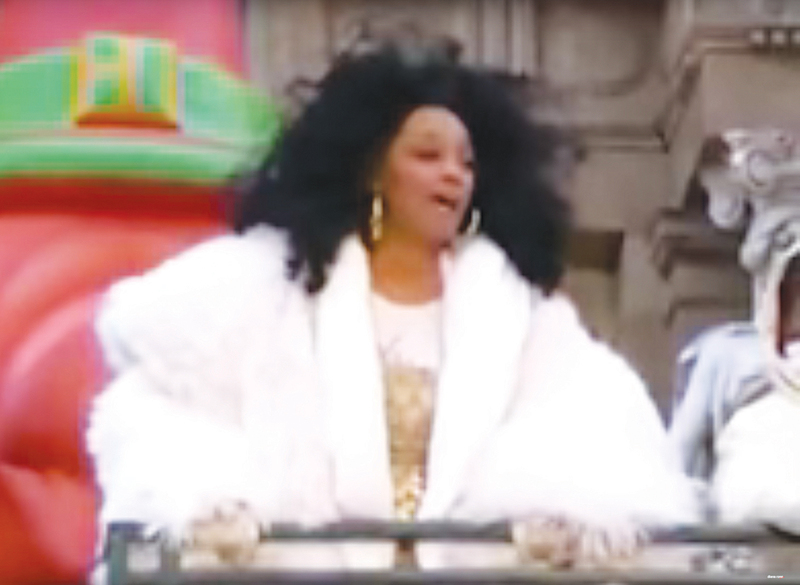 Motown legend Diana Ross, lookin’ good at 74. Red Star #2 came into contact with the large, gold, multi-pointed decoration atop Santa’s sleigh. The balloon deflated remarkably quickly, and floated down onto its handlers, including me, who caught it with raised hands and dumbstruck faces. Santa’s sleigh ends its trek accompanied by only one Red Star. Oh, the humanity! Our shock gave way to a sense of duty. We went into action, quickly flattening the balloon, rolling it up, hoisting it on our shoulders and marching, somewhat like pallbearers, toward the balloon collection area, as cops moved partitions waved us through. Thank God it was only a star, and not a character balloon, lest some Little Ones be traumatized. 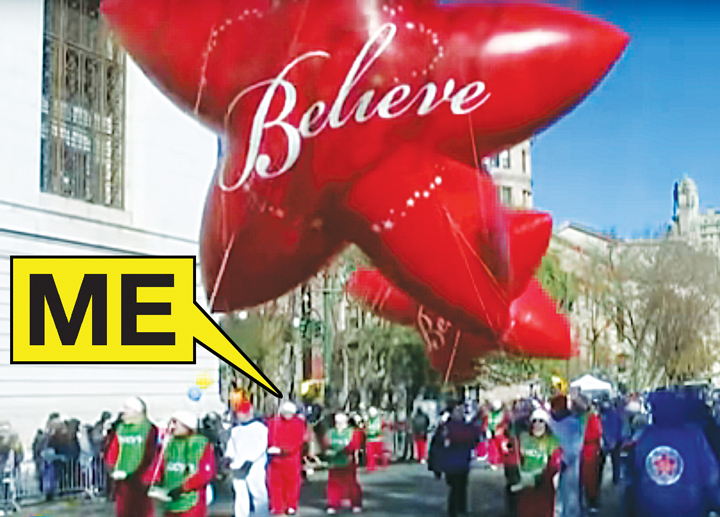 Being a balloon handler at the Macy’s parade is a harbinger of the holiday season, a fair bit of exercise, and an extraordinary opportunity for people-watching and taking in the sights of Manhattan in a different way. This was the undoubtedly the coldest of my six parades thus far. As clowns, musicians, dancers and fellow handlers gathered at 81st Street and Central Park West, we found ways to keep warm-ish. There was a lot of jogging and dancing in place. I learned how to do a “beat box” kinda thing from a younger handler, which helped to keep some feeling in my fingers. When you breathed with your mouth open — which you had to do because, TMI alert, your nose was running — your teeth felt like they had “brain freeze.” When you spoke, your tongue was thick, as if you were anesthetized. I could scarcely believe that on Thanksgiving Day, when New York City is so heavily visited, none of the trash cans around the park were working. These were Big Belly Solar containers marked UNIT LOCKED. They would not open. (Someone said it was to keep out terrorist bombs.) So what did people do? Pile their trash on top of the units, of course. On a day this windy, that’s just plain littering. Trash was everywhere. Just before the parade began, a family walked by us. A little girl of about 4 stopped and observed us in our Red Star costumes. “Are you an elf?” she asked me. “No, I’m just here to make sure the balloon doesn’t fly away,” I said. “Are they elves?” she asked, pointing to my fellow balloon handlers. “Kind of,” I said, and her family all laughed. I’d finally figured out that this girl wanted us to be elves. The Snow Pal balloon sacrificed a couple of handlers for our cause. We Red Star handlers were in a bit of a spot. There were only 17 of us, but 24 were needed for these balloons (12 each). And so far, we had one captain and zero pilots for the balloons. Our captain radioed for help. Before long, Red Star #1 received extra handlers donated by the Bjorn balloon, while Star #2 got a couple from the Snow Pal balloon. “Thank you, Snow Pal guys!” I shouted to them. “Sorry we were talking trash about you all morning!” (We weren’t really.) We also got the two pilots needed. When our turn to enter the parade came, our captain warned us about “land mines,” her genteel term for horse droppings. “It’s nice to be near Santa,” she called out to us, “but we’re bringing up the rear, so watch your step!” As we marched, she helpfully spotted every such instance, stood in front of them with arms spread, and yelled “Land mine! Land mine!” No one had to scrape their shoes that night. The Yellow Stars appeared earlier in the parade. One block seemed to have an inordinate amount of confetti. It was in mounds at our feet; some of us had to kick it aside to continue. But on closer examination, it wasn’t confetti at all; it was shredded newspaper. (An omen for a guy who was just laid off, for the second time in 10 years, from his newspaper job?) Then I saw the culprits: two chuckleheads in goofy turkey hats heaving fistfuls of shredded newspaper from extra-large, clear bags. I feel for you, cleanup crew. I also felt for our captain, who was exemplary in every way — really one of the most positive, helpful and pragmatic captains I’ve served under in my six parades. I felt bad because, through no fault of her own, Red Star #2 didn’t make it to the finish line. A fellow handler and I later shared our suspicion that the gentleman who prepped us for the TV cameras — and kept directing us to get closer and closer to Santa’s sleigh, even as the gusts continued — may have given Mother Nature just the opening she needed to play her little mischief, thus reminding we mortals that we are not in charge. We balloon handlers “believed” we could get Red Star #2 to the finish line.